With an airport escalator title sequence that apes "The Graduate," Quentin Tarantino announces his return to the director's chair with a trademark pop culture reference. 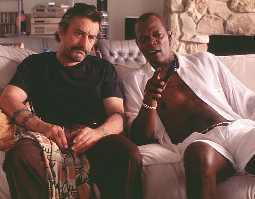 "Jackie Brown," which Tarantino freely adapted from Elmore Leonard's "Rum Punch," is bursting with the rapid-fire street wise banter and dark comedy that made him a household name, then lead to a curious backlash after scores of imitators flooded Hollywood in his wake. But the ex-video store clerk with a penchant for obscure B movies picks up right where he left off, opening this picture with a very Tarantino conversation -- ghetto arms dealer Samuel L. Jackson and parolee Robert De Niro discussing the finer points of running guns. "Then there's the AK-47," Jackson says, "When you absolutely, positively have to kill every motherf***** in the room." Starring '70s blaxploitation queen Pam Grier in a the title role as a stewardess for a bottom rung Caribbean airline who launders money on the side to help make ends meet, "Jackie Brown" isn't a great film, but it has the air of its director's wicked brilliance. A standard caper flick pumped with slick wit, the movie is essentially the story a money drop gone wrong, told from several perspectives. Early on, Grier is arrested for smuggling by federal agent Michael Keaton, and in exchange for leniency agrees to help him bust Jackson's gun ring. But she and a world-weary bail bondsman (Robert Forster) have concocted a bait-and-switch that she hopes will see her keeping the money while Jackson takes the rap. Of course something is bound to backfire, and it does, resulting in the body count you might expect -- although Tarantino has toned it down a bit this time, applying blood with a squirt gun instead of a bucket. The movie pays only lip service to Tarantino's glee for gore and trades more on his ability to write catchy workaday dialogue and his talent for bringing uncharacteristic performances out of character actors. Known largely for variations on "Foxy Brown," Grier shows fine talent here with layers of conflict and doubt, and even trades commentary with Forester on the ills of aging as they form a budding romance. As the aimless parolee, De Niro is understated and free of his usual physical quirks, playing a character with the pizzazz and demeanor of a pile of laundry. Jackson's over-confident gun smuggler is another lower-tier criminal, like the one he played in "Pulp Fiction," but because he is a consummate chameleon the two characters have little in common outside of a menacing demeanor and an unintentionally funny personality. Keaton and Bridget Fonda are perfect in comic relief roles as a gum-snapping ATF doofus and Jackson's slinky, stoned-out, bimbo girlfriend. The characters all converge at an aging shopping mall in L.A. for the money drop, which we see three times from three points of view. This scene is where Tarantino's gift for suspenseful storytelling shines. Although we know the outcome, there's a spider web of double crosses at work and the tension is actually more acute each time through the same events. What's more, at the same time Tarantino manages to capture everything but the smell of a tacky, 20-year-old, suburban mall. "Jackie Brown" takes a long time to trail off after the caper is complete, following one plot thread to an obvious conclusion. I was ready to give the film three stars up until the boring last 30 minutes (which could have easily been trimmed to 10). Tarantino may never make another "Reservoir Dogs" or "Pulp Fiction," but if he can crank out a film like "Jackie Brown" every year or two, he has a long career ahead of him.